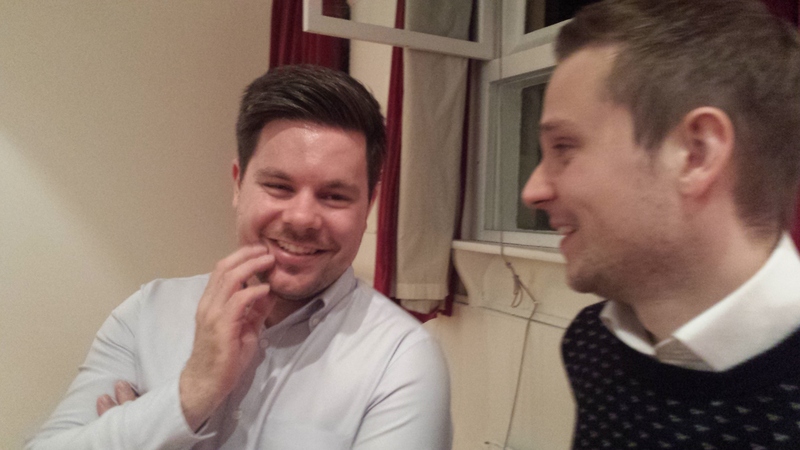 I’m so glad Thomas’s talks have become an annual fixture at Perfume Lovers London. After a couple of fantastic Summer Specials this time The Candy Perfume Boy was back with his Jasmine Award winning Guide To Violet – Live! As usual I’ve condensed what was said so just imagine everything Thomas says being even more articulate and entertaining and you’ll be on the right track. Thomas: I very much see violet as an underdog. It has a reputation for being old fashioned or grannyesque (always a compliment, IMHO). I wear violets to work and people always say they hate them. Once I swanned in a cloud of Insolence (a mushroom cloud) and after about two hours my colleague called our maintenance department because he thought the generator outside was leaking fumes. Yeah, I’m fabulous. The truth is that there are lots of intriguing and contemporary violets out there. I wanted to explore them all and prove that violet could be cool. Violet perfumes were made popular in Victorian times. They were worn solely by the rich due to high cost. Synthesized materials (alpha and beta ionones) revolutionized the industry. As violet perfumes became affordable, their popularity grew. 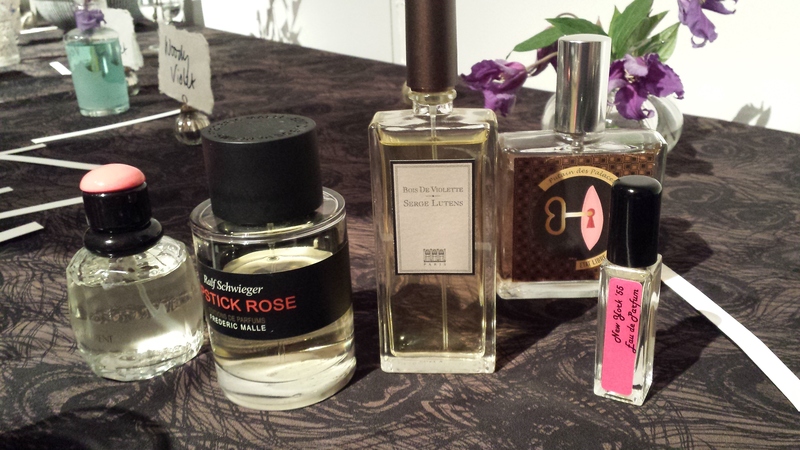 Basenotes lists over 200 fragrances with violet in their name, most of which are late 1800s/early 1900s. Their popularity has waned because they feel very Victorian. I have some synthetic materials for you to try. Thomas: Most people smell it and immediately say “Parma Violets”. Sweet, floral and jammy, alpha ionone is recognisably a violet smell. There’s also a bit of paint thinner in there. As it dries down it becomes airy and ethereal. I think it’s pretty cool. Thomas: This is much more earthy and woody with a mineral feel. It’s used to create a dirty violet. It becomes sweeter as it dries down. 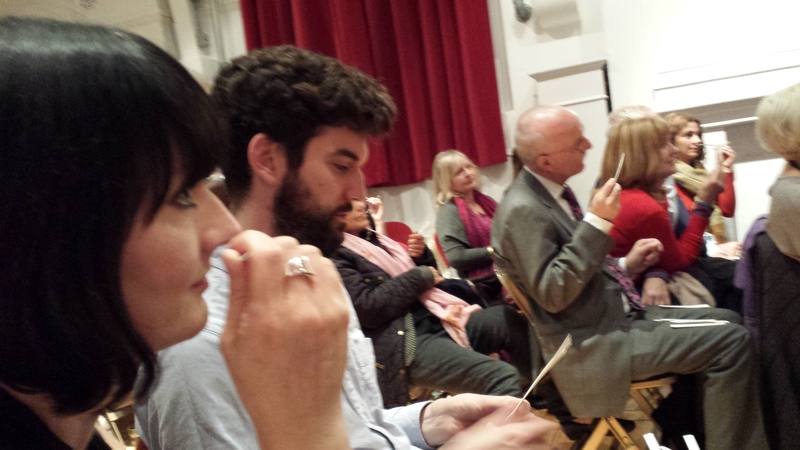 Audience member: It smells of hessian sacks. Notes include almond, violets, orange, white musk, heliotrope, white flowers, patchouli, cedar, vetiver, iris and vanilla. Thomas: This is a straight-up, traditional violet but quite multi-faceted. There are lots of other things in there which accentuate and extend the violet, like iris, almond, heliotrope, patchouli and vanilla. It’s demure without being old-fashioned. It has lots of alpha ionone and I think it’s very pretty. It’s one of my mum’s perfumes. Lila: Although it’s been discontinued you can pick it up quite cheaply at the discounters. 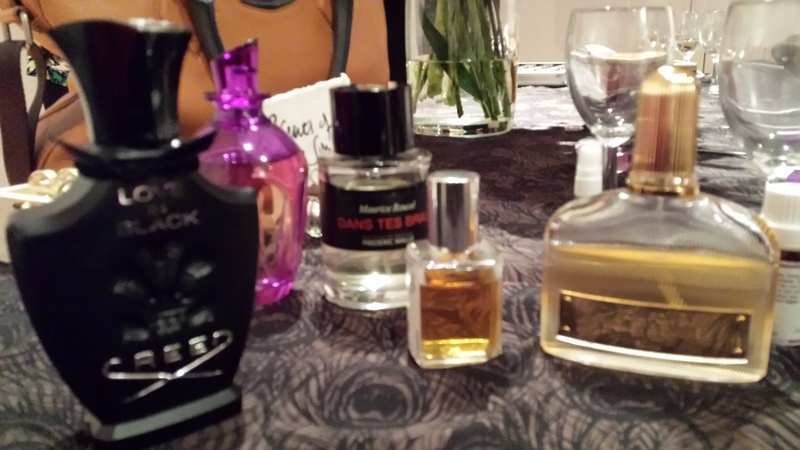 Notes include violet leaf, Italian mandarin and pink pepper, iris absolute, orris butter, jasmine. musk, suede, cedar, vetiver and benzoin. Thomas: This is a modern violet aimed at a young audience. It’s part of the signature collection, although its sister perfumes, Black Orchid and White Patchouli, are more high fashion. Violet Blonde feels more casual and ready to wear. It’s spicy/peppery with wet flowers and a green feel. Jasmine strengthens the violet and makes it bold. It becomes creamier in the drydown. It’s probably my favourite violet but it’s being discontinued. Notes include red fruits, violet, rose, orange blossom, raisins, balsams, iris and tonka bean. Thomas: I actually call this “The Ridiculous Violet” because it’s so over the top. It opens with a big blast of violet hairspray. This is the EDP which has less hairspray than the EDT. My husband has just said I wear this one too much. It’s an abstract gourmand with a pastry vibe. I think it’s very Guerlain, with a nice nod to Apres L’Ondee and L’Heure Bleue. Notes include heliotrope, jasmine, woodsy notes, patchouli, pine tree, cashmeran, sandalwood, musk, incense and violet. Thomas: Like Insolence, this was done by Maurice Roucel. I like that it’s not in his usual opulent style. It’s the dark little weirdo in the corner. It’s very subversive and pared down. I think it smells of earthy, purple mushrooms. It has lots of beta ionone. Lila: It really reminds me of 1950s men’s aftershaves. Thomas: It’s a bit salty, like bodies intertwined. It also feels very academic and clever. Technically very well done. Audience member: It’s a sweaty professor! Thomas: I don’t wear it but I like to sniff it. Notes of earthy violet leaf, rough and worn leather, rich agarwood and dark spruce. Thomas: We’re going from the sublime to the ridiculous. This pushes violet to the very edge, to the limit of acceptability. It’s wonderfully terrifying. It’s plasticky, dank and ozonic. I also like to call it “the kitchen knife wielding violet, dressed solely in a bloody rain mac”. This is the scent that Divine would wear in John Waters’ Pink Flamingos. 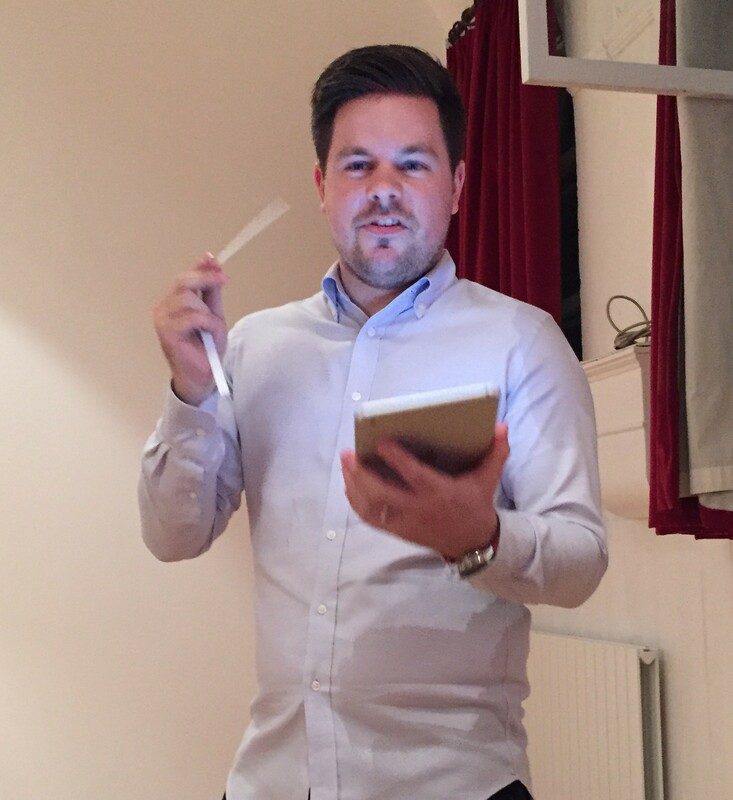 Audience member: It the smell of dusty radiators being turned on for the first time after the summer. Thomas: It’s violent, obscene and disgusting and I can’t stop sniffing it. Notes include violet, jasmine, cedar, iris, cloves, tonkin musk, black currant and Bulgarian rose. Thomas: I know this is a polarising brand but they do have one to two good fragrances. Love in Black is mostly iris with violet. It’s hissy blackcurrant, doughy/bready iris and a skyscraper violet. It’s an odd one – it took me a long time to fall for it. Definitely a slow burner. Notes of violet, jasmine. ylang ylang and rosewood. Thomas: This recent release is supposed to be about chance encounters on the street. It’s green with a mineral facet that does evoke cold concrete. It’s very grey and sparse. They describe it as fresh, sweet and uplifting. I find it to be powdery in a very dry and green way. The violet is a bit dowdy, almost seen in monochrome. Audience member: Algae-ish and not in a good way. Lila: It’s like snapping pea-pods. Audience member: Eau de Mange Tout. Thomas: You have to be a hipster to like it. Thomas: I hope this evening has given you some insight into violet and made you see it’s not uncool in a granny-ish way. It’s actually cool in a granny-ish way. Lila then passed around some L’Heure Bleue pure parfum for us to try as it features a violet note. I feel sheepish admitting it’s one of the Guerlain classics I’ve never got on with. My excuse is that it gives me a headache. I have to say though, that the extrait is beautiful and quite different to the EDP, being smoother and much less powdery. Lila pointed out that pure parfums actually have to have a slightly different formula, so they do vary from the other concentrations. Many thanks to Thomas and Lila for a great evening. Thomas is such an engaging and well informed speaker. He has such a great nose and finds clever and novel ways of describing scents. Do check out his excellent “Guide To” series on The Candy Perfume Boy, if you haven’t already. The other instalments are Lavender, Oud, Chocolate, Orange Blossom, Vanilla and Lily. So far I’ve struggled to find a violet perfume that suits me, but recently I was impressed by Violette Fumee from Mona di Orio. Please share your own favourites and feelings about violet fragrances in the comments. This entry was posted in By Tara, Violet and tagged Fragrance, London, Perfume, Perfume Lovers London, The Candy Perfume Boy, Violet. Bookmark the permalink. As ever, this was such an enjoyable read, T – you have captured the humorous highlights perfectly. I enjoyed both Thomas’s remarks and some of the feedback from the audience – one about turning on a dusty radiator after a long interval stays with me in particular! Violet perfumes are not really my thing but I do have a soft spot for Le Dix, also a discontinued Patou whose name escapes me, and which is a fresh green sent with violet, possibly beginning with ‘r’. Thanks, V. Thomas is such a great speaker and Tanya can always be relied upon for a great quote (she came up with radiator one and the sweaty professor). I remember Sarah McCartnery shared vintage Le Dix at her PLL event but I can’t bring it to mind. Vintage Le Dix (Balenciaga) is described by some as melancholic but the powdery, musky,cool violets were so pensive and soothing to me….it eventually ended up at discounted stores for a song only to re-emerge reformulated…word has it the re-formulation is much brighter and more uplifting. Violet fumee is amazing..it was instant love for me. However I haven’t been using it as much as I thought I would. VF is fab. I wonder why you haven’t worn it much. I think it would be good for everyday wear, as classy as it is. LOVE the violet…Le Dix,L:heure bleue and Apres L’Ondee are some of my vintage favourites and for contemporary perfumes no one does violet like the artisanal line SSS…Wood Violet, Voile de Violette and Lieu de Reves are gorgeous…I also just ordered some essential oils from Mandy Aftel’s website including alpha ionone as I plan on making my own violet perfume with that along with bitter almond, bergamot, tonka, violet leaf, orris, anise, cassie absolute, lavender absolute, bourbon vanilla, ambrette seed,opoponax,styrax,peru balsam, my own pine tincture that I procurred from a pine tree we cut down and oakmoss….we shall see how it turns out 🙂 !! Thanks for mentioning the violets by Senoma Scent Studio. Well worth noting. Your own violet perfume sounds like it will be amazing! Alpha ionone is fantastic and pretty much a ready made perfume all on its own. Great write-up Tara. I do enjoy violet in perfumes – especially Putain de Palaces and now Violet Fumee. I must confess that I also enjoy Guerlain Insolence. Have a wonderful afternoon. Thanks Sandra! Insolence is a lot of fun. I bet you smell great in it. Hope you enjoy the rest of your day too. Thanks Joshua. We miss you!